The first clutch of the season captured on the nest camera. The breeding pairs at the park laid their first eggs of the season this month. Issy waited until after the Easter Bank Holiday to start her clutch of five eggs. As planned, keepers waited until she had been incubating the clutch for at least five days (25% of the incubation period) and then transferred them to the artificial incubator. Tristan and Issy immediately started rebuilding the nest with the intention to re-lay. As with all artificially incubated eggs, these were weighed, measured, and then set in the incubator. Staff weighed the eggs daily to monitor weight loss and candled the eggs to check on development. After evaluating methodology and data from last year’s breeding season we decided to set the initial humidity levels lower at 30% instead of 50% to increase hatching success. This seems to have had a positive effect last year. Sadly, four of Issy’s five eggs died very early on, potentially before staff removed them from the nest. The fifth egg (not necessarily laid in that order) survived. Not only that but it showed an almost perfect pattern of expected weight loss over its incubation period. We think this was due to the reduced humidity. The expected hatch date for the egg is May 1st. Gwinny waited until the end of the month to start laying. She did the same last year and timed it with Issy laying her second clutch. We had hoped that this year the male having now acquainted himself with what an egg looks like, would co-operate and not throw them out. Alas, the first sign of Gwinny having an egg was a discarded one on the aviary floor when the keeper went in to feed. Looking back at the recorded footage from the nest-camera we spotted Gwinny laying an egg at around 20.00 one evening. At 06.15 the male went in and removed the egg in his beak when Gwinny was off the nest. Watch in this nest camera video as the male removes the egg – and watch Gwinny return showing her disapproval! We set up the cameras so we could watch from our computers at home. At 06.00 the next day Harriet woke, switched on the computer and dialled 9-9-EGG! Catherine, living the closest to the park, leapt into action and headed straight for the aviary to rescue the egg. Harriet continued to watch as the male carefully removed the egg just before Catherine arrived at 06:10! We were able to rescue one egg from Gwinny’s clutch. We do not actually know at this stage whether the egg is fertile. We will have to wait and see. After Gianna’s master class in the art of nest building last month she advanced to demonstrating how to incubate an egg! 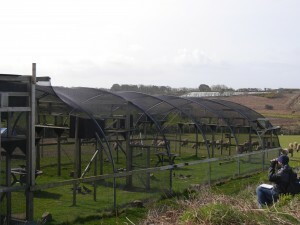 When she finished building the nest she spent a few days moping around the aviary looking a bit lost. This period is when you expect the pair to be copulating. Gianna’s substitute partner (guess who!) spent a lot of time tickling her lower back resulting in quivering wings and tail feathers. I am not sure I can go into much more detail for readers before the watershed. The next stage was to provide her with a dummy egg to trick her into thinking she had started laying. It worked and she laid her first slightly odd-looking egg. Nevertheless she was very proud of that egg and has been incubating it diligently ever since. This is very good training for next year if she is to become a foster mum. 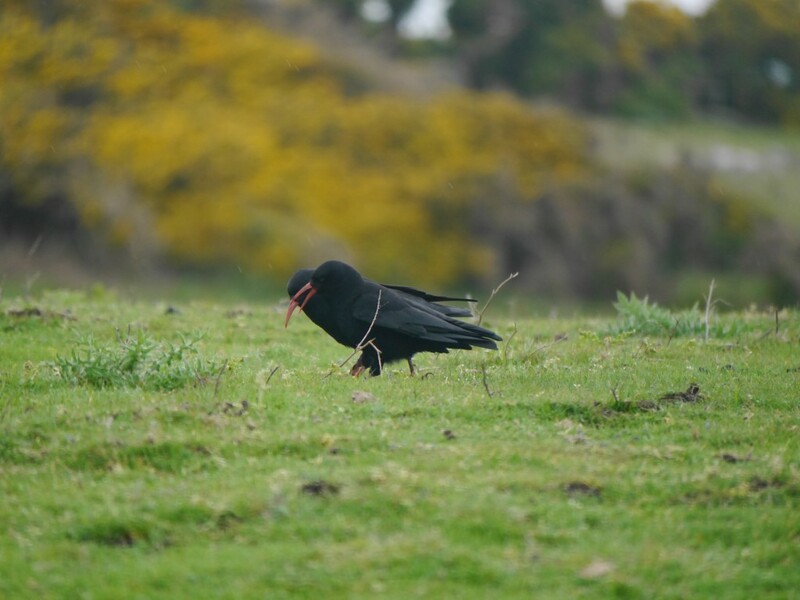 In March we witnessed the first twigs to be carried by nesting choughs out on the north coast. This month things stepped up a gear. 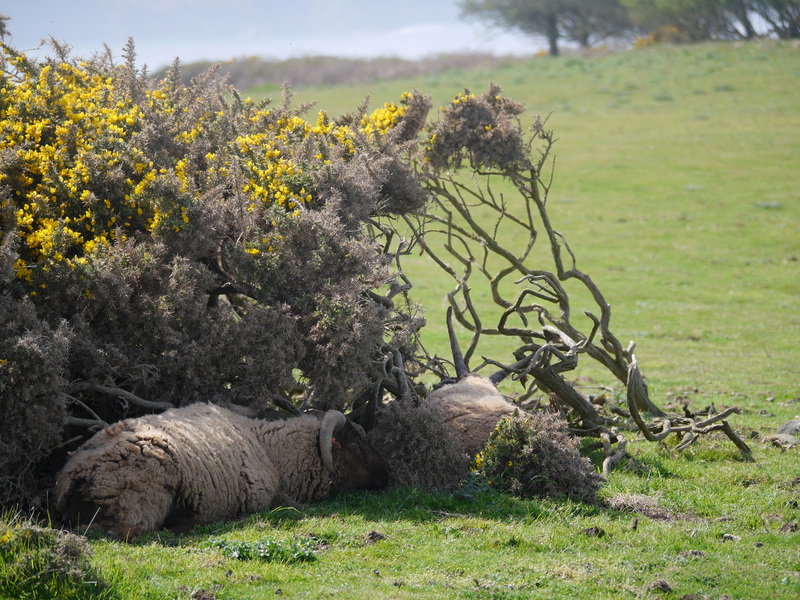 Twigs, gorse, dried bracken, and wool were just some of the items collected by the choughs. Interestingly the two dominant males did most of the work flanked all the time by their females. In the case of White, by both his females. 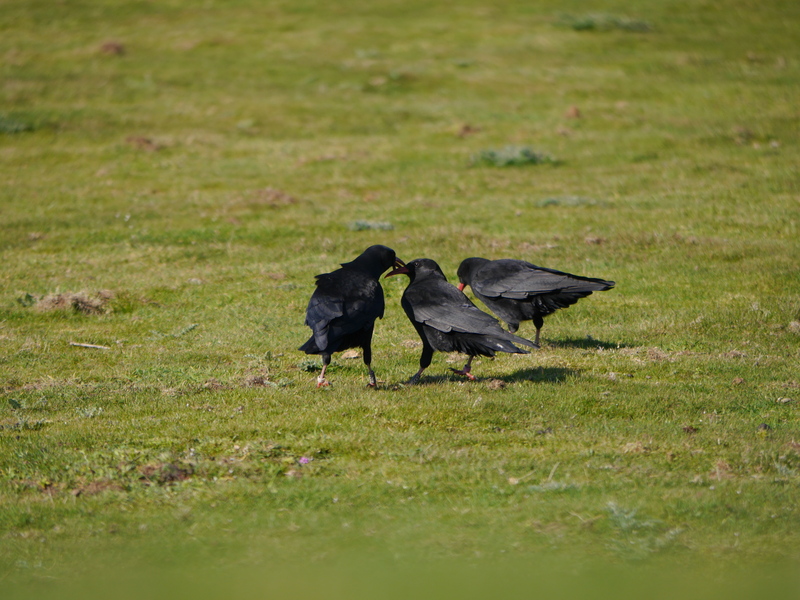 White and one of his two females, Black, taking time out to bond over a preening session. Photo by Liz Corry. 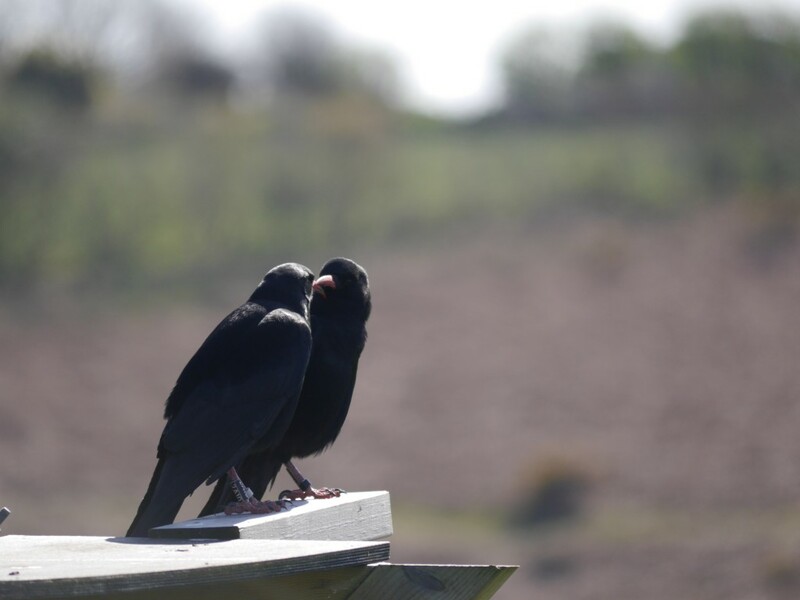 With the nests complete towards the end of the month (well at least thats what we think) the males turned their attention to courtship displays and mating. 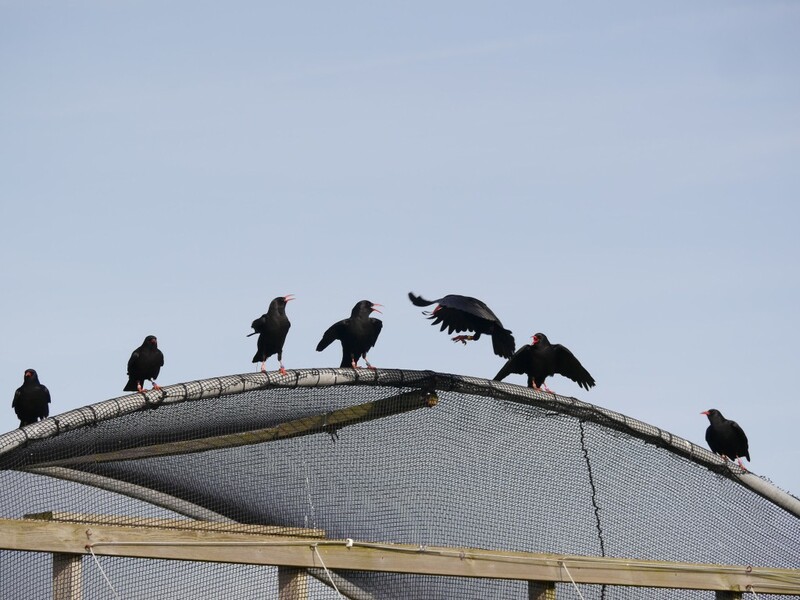 Watch this short video of one of the males displaying in the aviary towards two females. 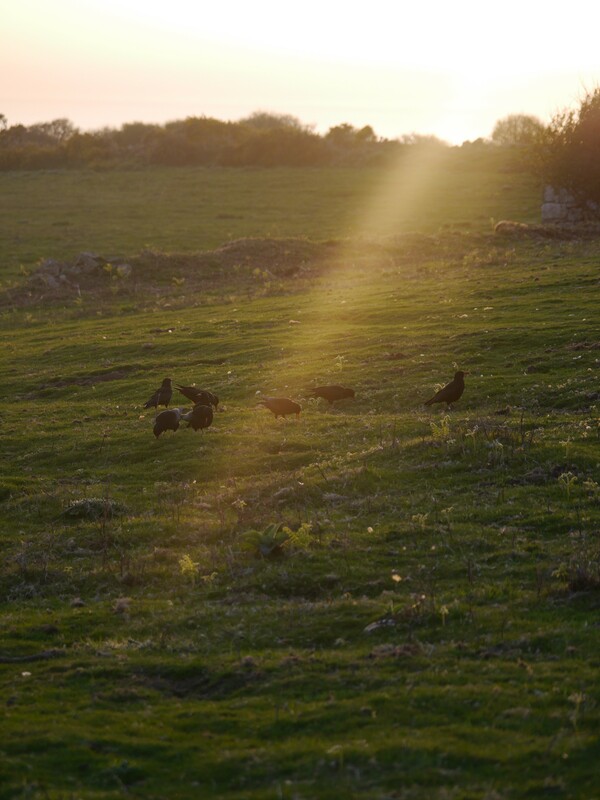 For a while it seemed like April would be a very average month in the Sorel chough calendar. Then, true to form, scandal broke. Dingle, our hand-reared male, didn’t come home to roost at the aviary one night. For the past month or so the juveniles and an unpaired adult, Red, spent their nights in the aviary. The 8pm radio-tracking session towards the start of the month showed that Dingle was not there. Neither was Red! Growing up, Dingle and the other three hand-reared chicks were always very close. Dingle begs for food from them, often they cave in and feed. He might reciprocate. Chickay and Bean probably spend more time with him than little Caûvette. Mutual preening observed on a daily basis. Maybe Red’s recent heartbreak from Green and Dingle’s ‘teenage’ hormones have led to the two forming a bond. Can it lead to something more? Red and Dingle are now spending time together and roost away from the juveniles. Photo by Liz Corry. Green dropped his transmitter on the 19th. 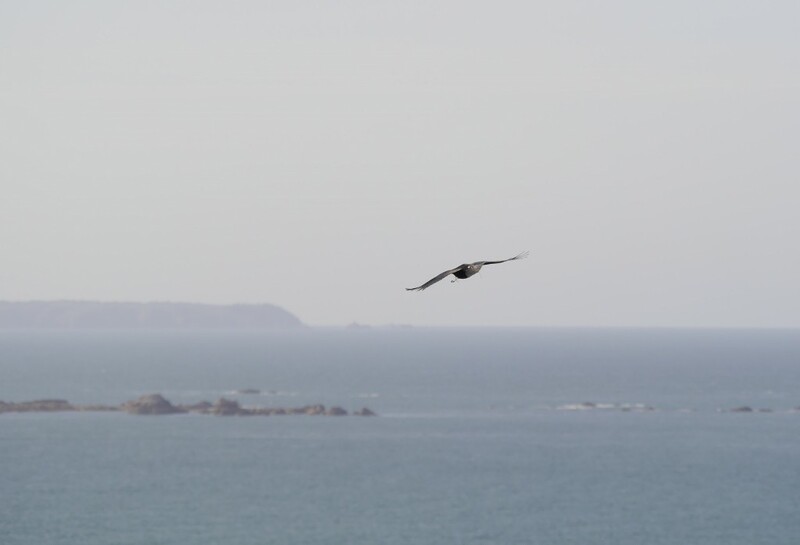 This has very little impact on his way of life, but is extremely frustrating for the team as we can no longer distinguish between the three males in flight. 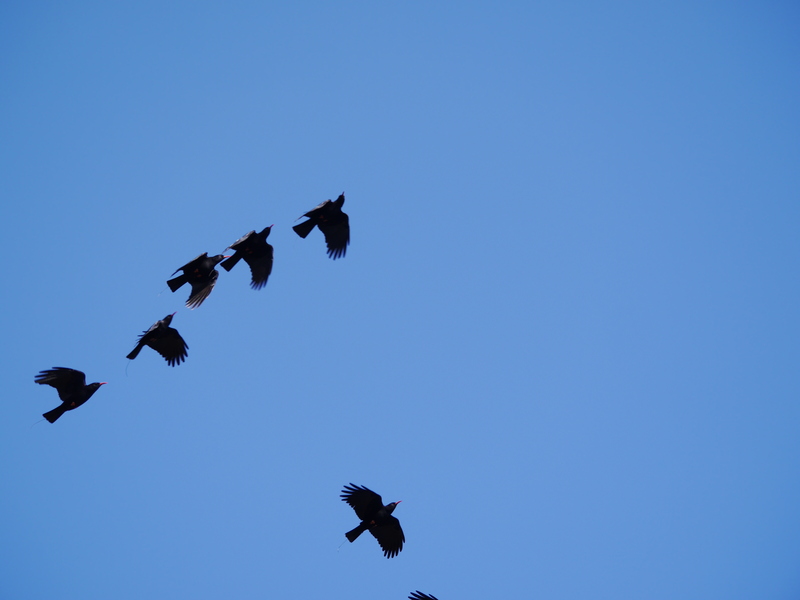 Our behavioural observations are now biased towards those birds we can identify, i.e. 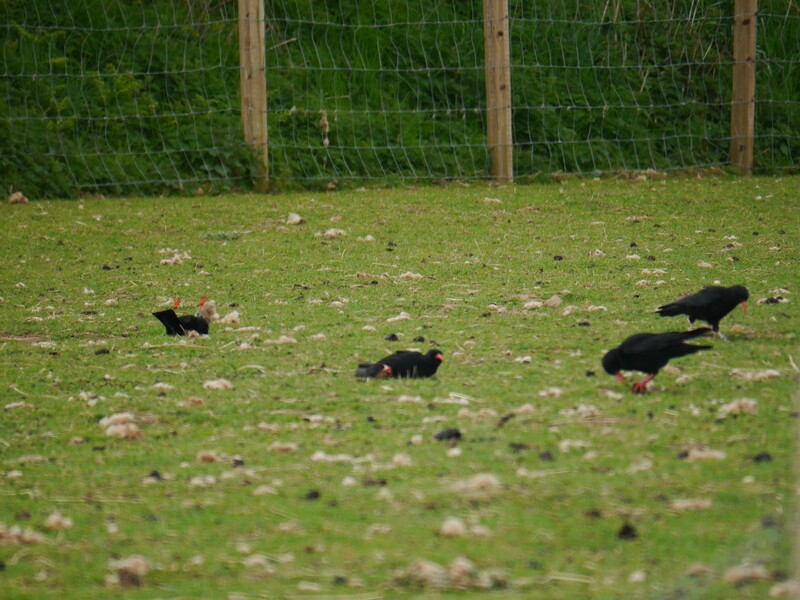 choughs feeding on open grazed land or at the aviary. 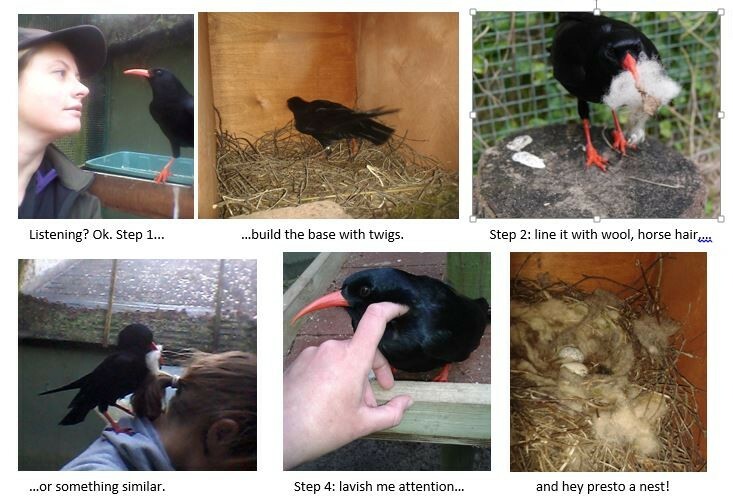 We have stopped these observations and are now focusing on nesting behaviour. 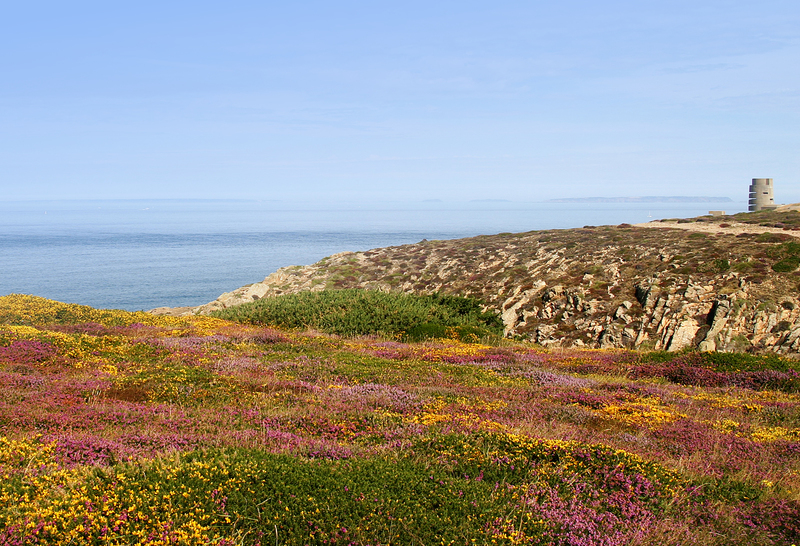 The radio-tracking study of the males’ home range also terminated at the end of the month due to the lack of transmitters. Despite trying to adapt we could no longer collect the required data. 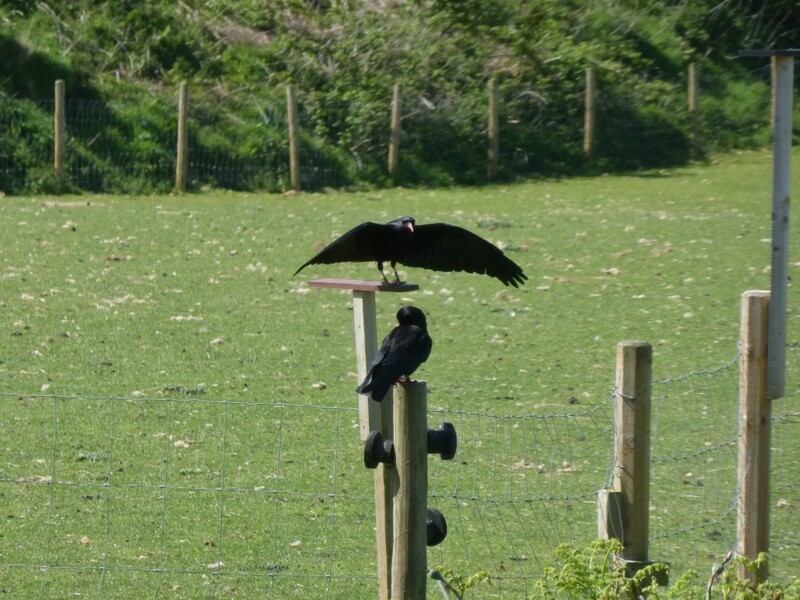 This will not stop us from following the choughs. It just restricts the amount of quantitative data for analysis. 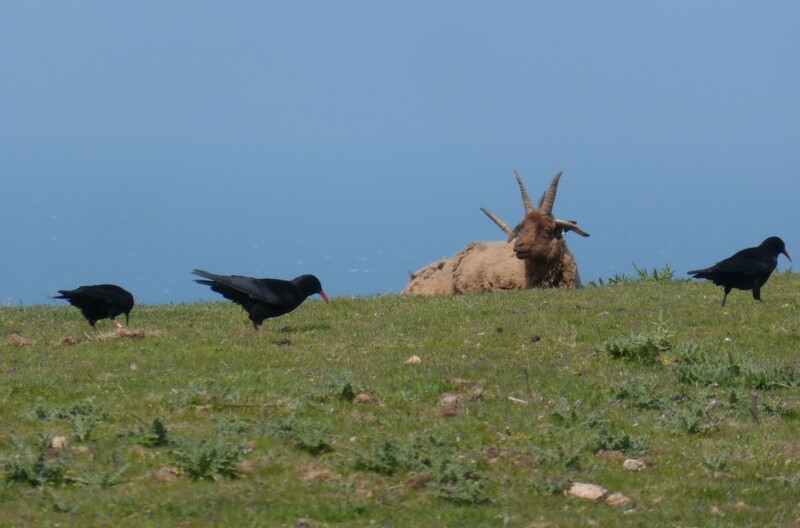 Choughs probing the sheep-grazed coastline. Photo by Paul Pestana. Jen sampling gorse cupcakes. Photo by Harriet Clark. 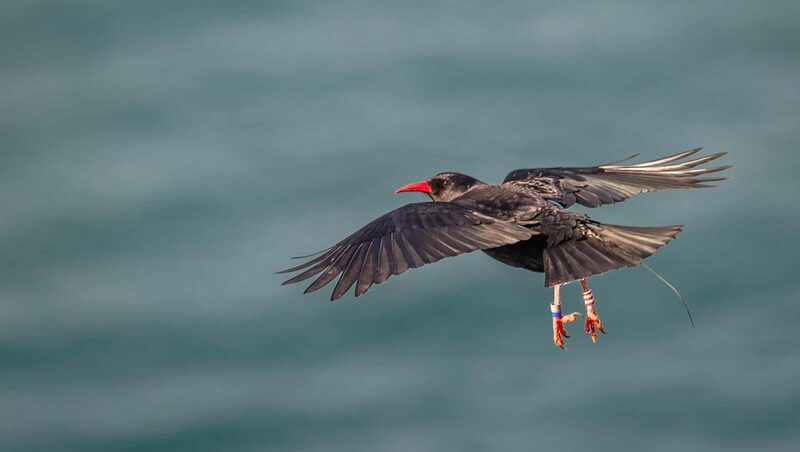 Jennifer who joined the project in October last year, bid farewell to the choughs and Jersey this month as she returned home to the UK. Jen is the only non-resident student who has been able to commit to more than three months so far. I’m sure that as the winter months set in at Sorel she began to regret signing up for so long. 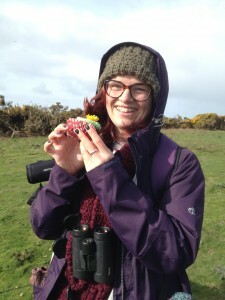 Jen assures me that it was worth staying the course and has learnt a great deal including how gorse flower cupcakes taste! We are extremely grateful to have had Jen on our team and admire her dedication throughout. Jen handed over the reins to our new student Paul Pestana. 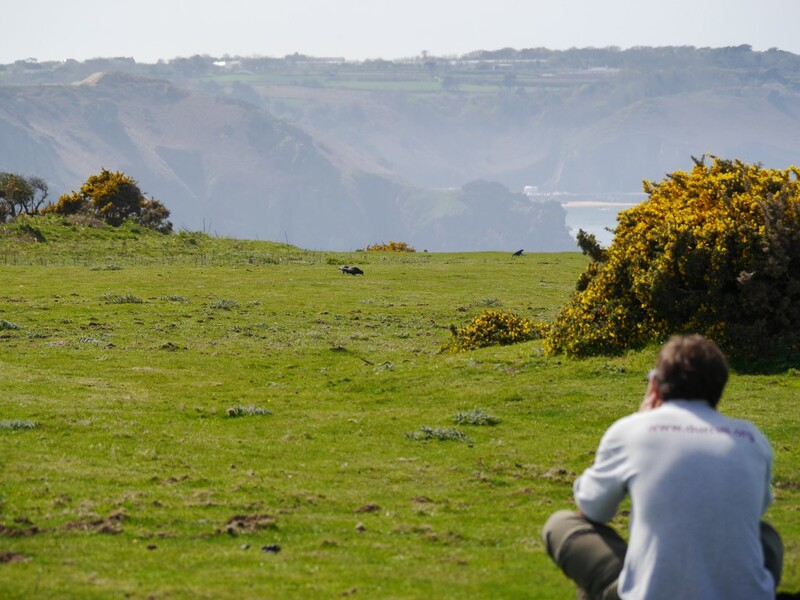 Paul is a familiar face at Durrell having swapped telecommunications for a career in conservation several years ago. His first step was becoming a student placement within the Bird Department before going on to study at the Durrell Institute of Conservation and Ecology (University of Kent). For the last six months Paul has been a volunteer in Mauritius working closely with the pink pigeons. The skills Paul has acquired out in the tropics are very applicable to the student placement role. With the added bonus of not having to deal with mosquitoes. 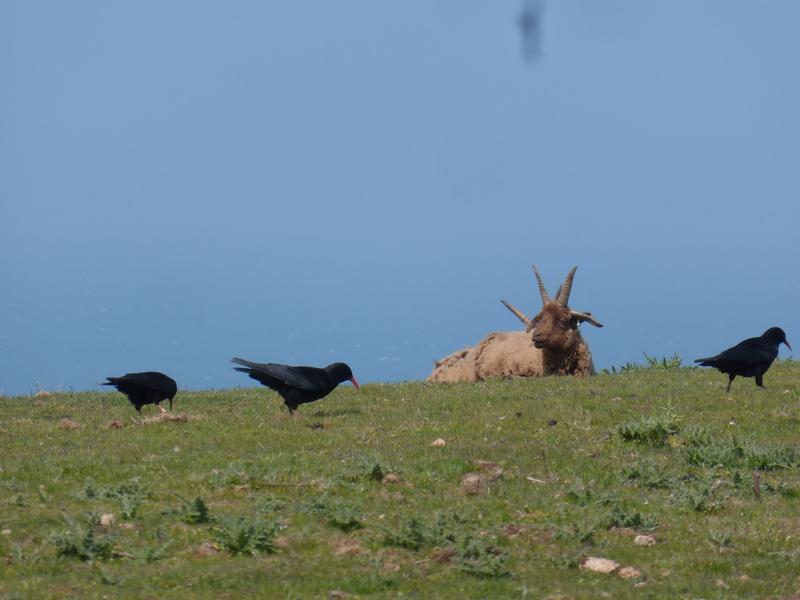 Whilst not quite up to tropical standards, the weather in Jersey improved greatly this month with the thermometer pushing 25°C – clearly challenging to both choughs and sheep (and field staff who forget sun block!). 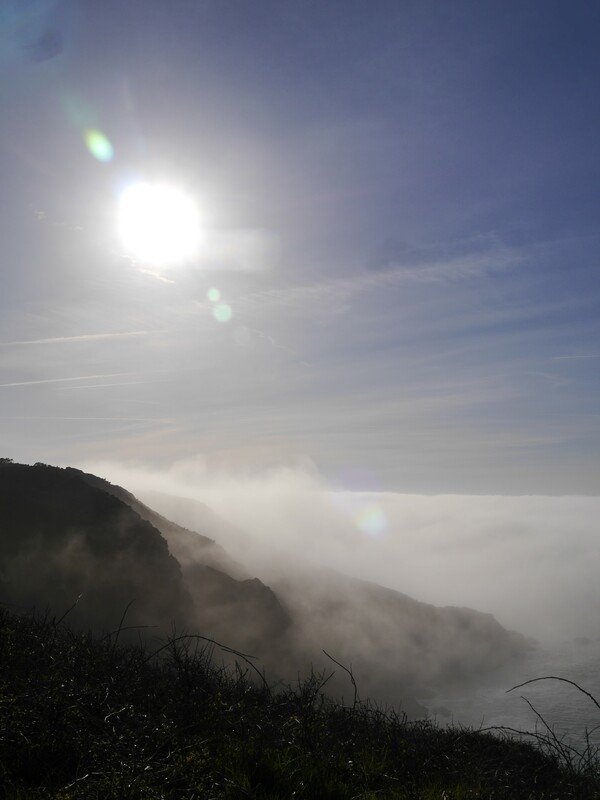 The most challenging weather for staff at Sorel, however, may be when the sea fog rolls in. 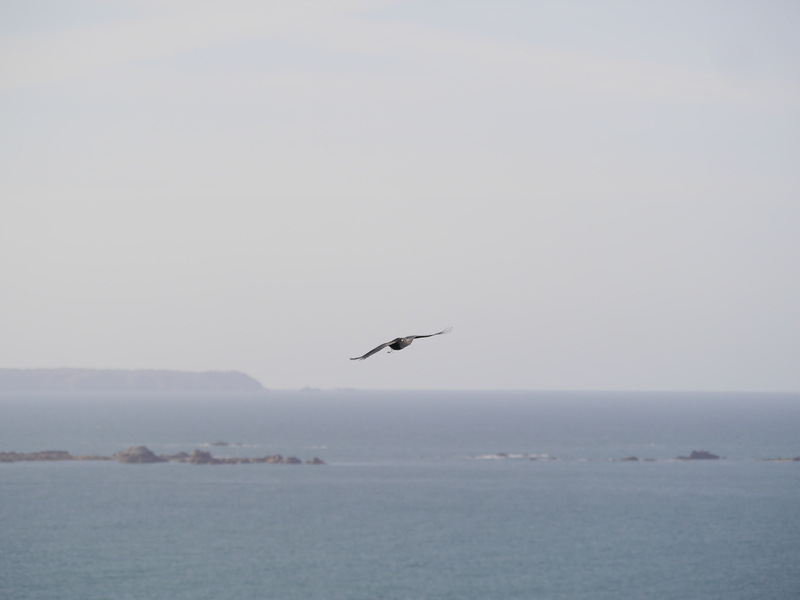 Breath-taking it may be, yet really really annoying when you are trying to follow birds across a 2km stretch of coastline. The spate of good weather meant the juveniles had the opportunity to kick back and relax. 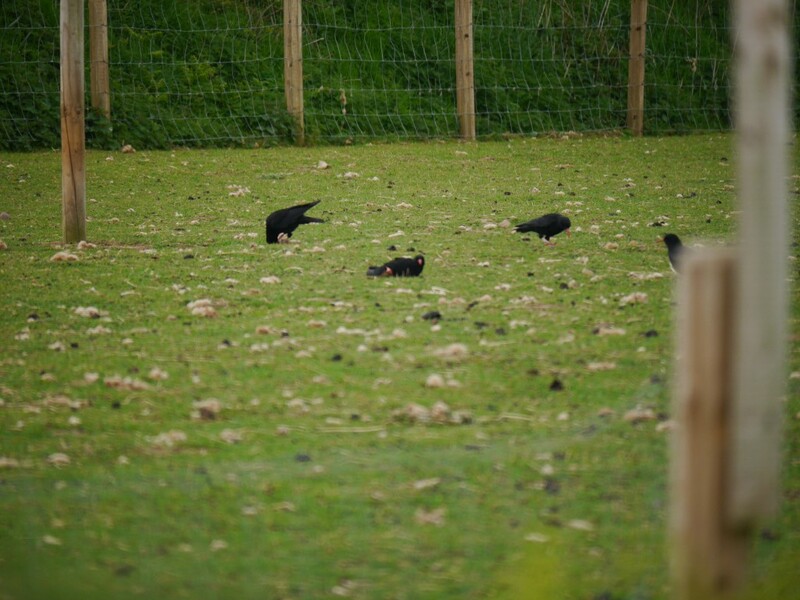 If ever proof was needed that choughs play then this was it. 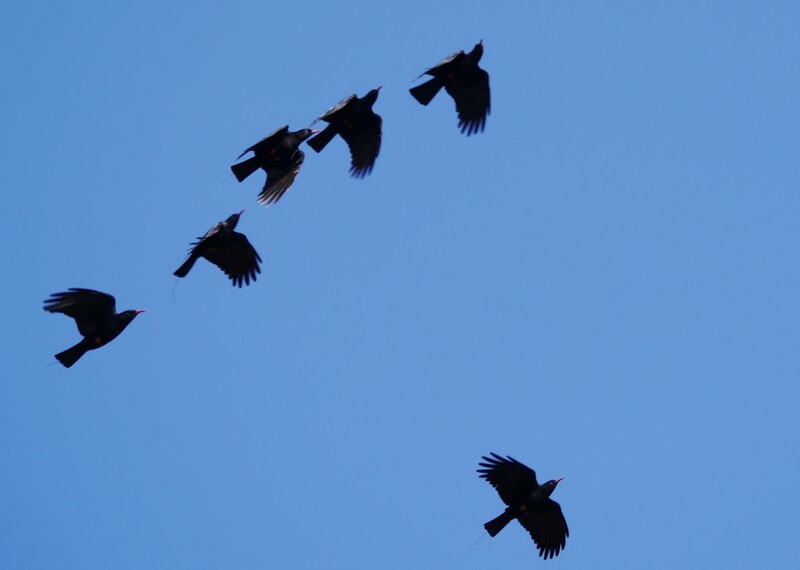 When corvids play it releases endorphins the same way as in humans, making them feel happy. 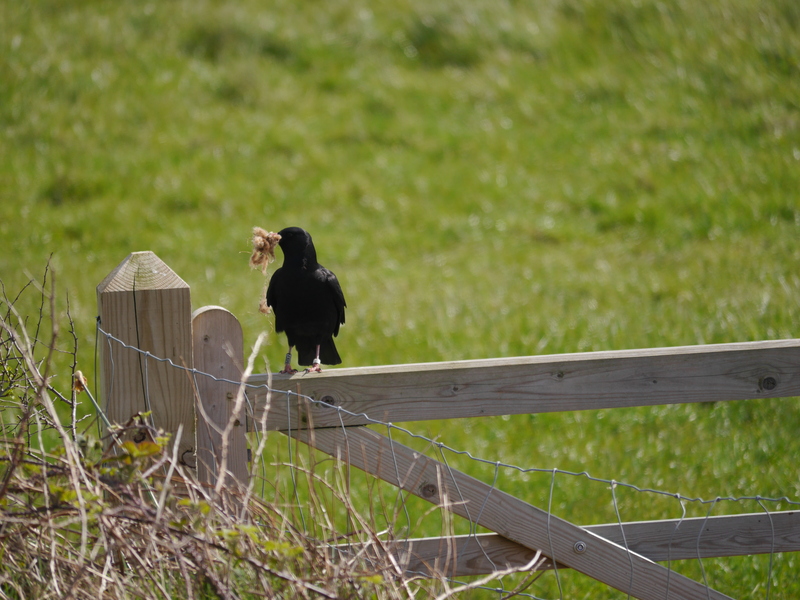 And when choughs play with wool they are actually learning; watching how the adults pick out wool to line nests. We still have no news on the fate of Jean. We have officially declared her as deceased in the International Species Information System (ZIMS). There is though one new theory to her mystery disappearance. Alien tractor beam. 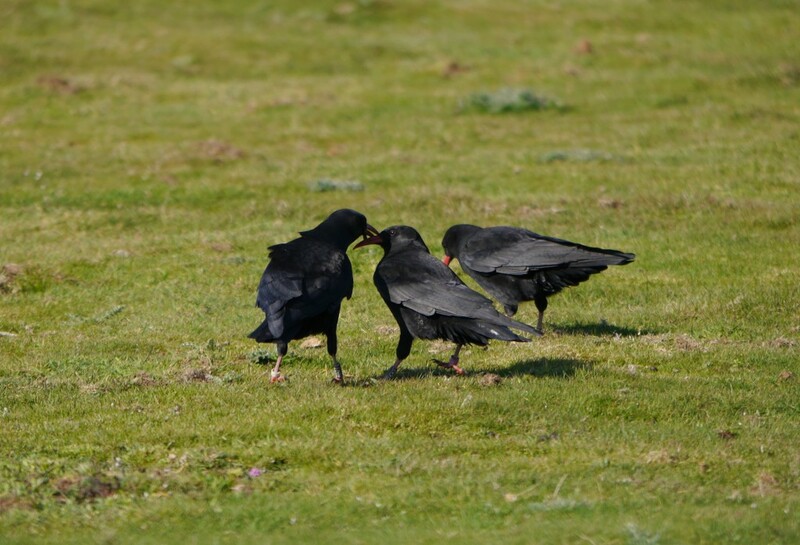 This entry was posted in Bird monitoring, Choughs, Top News by Glyn Young. Bookmark the permalink. Another great update Liz, thank you. Great to see the videos…..Poor Gwinny, she will have to sort him out!!! Thank you for yet another brilliant update with so many great photos and the videos. Hope you are going to enter all this effort into a competition in the future? I am sure you will win hands down. Fabulous report and amazing video footage! Great read as always, loved catching up on Aprils exploits!